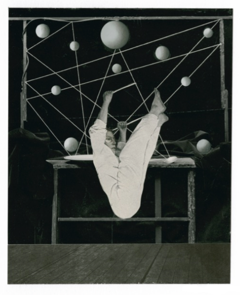 The great Dadaist and Surrealist Max Ernst developed the technique of collage in 1919, employing engravings from books and photographs from newspapers and magazines. Cutting up the source material and recombining it imaginatively intensified his already substantial “visionary faculties” and led him “beyond painting” (or at least the limits of painting at the time) to create strange worlds that reflected, with anarchic, absurdist humor, his and his colleagues’ disgust with conventional morality. 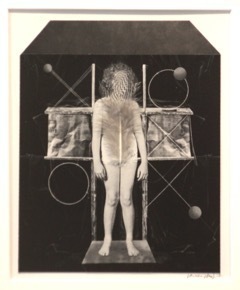 His collage novel, “La Femme Cent Têtes (The Hundred-Headed Woman)” — Surrealists were fond of puns and wordplay — was described by André Breton as “veritable sllts in time, space, customs and even beliefs.” The collage technique was employed (with and without assistance from other media) with equally disturbing/satisfying results by kindred independent spirits like Joseph Cornell, Bruce Conner, Wilfried Sätty and Lawrence Jordan. If collage is taught and studied today more as method than madness, the subversive strain of collage — melding leftist politics with visionary poetry — thankfully survives in today’s mad, mad Moloch world. Which brings us to Vanessa Woods. Woods' show, “Somewhere Between Here and There,” features twenty-five new collages that are small but fierce. They continue her investigations of recent years, including a dialogue with Ernst, as well as with her friend and mentor, the photographer/collagist Ken Graves, eleven of whose collages are included here [See Cheng’s review of Graves’ 2013 show at Gallery Paule Anglim, now Anglim-Gilbert Gallery: http://visualartsource.com/index.php?page=editorial&aID=1815. — Ed.] When Graves died in 2016, he bequeathed Woods his collection of materials, so it is no surprise that Woods’ new works are meant as an homage, and are also revealing of Graves’ influence. As Maria Porges points out in her catalogue essay, the new works create implied narratives, as the figures are surrounded by theatrical environments rather than isolated against blank backgrounds. Indeed, Woods seems to move toward painting, literature and theater — and a bit away from abstraction. If her previous work featured contorted and sculptural bodies (sometimes headless) in isolation, these are placed in a dark, deep, cinematic space. No fewer than sixteen of the works feature standing protagonists, their features obscured by cloth hoods (or real feathers), standing as if for inspection. The source images are perhaps bureaucratic or medical. Wood’s places them in mysterious indoor/outdoor, real/simulated surroundings reminiscent of Joseph Cornell’s assemblage boxes or Giorgio di Chirico’s vertiginous plazas. Few artists these days celebrate a commonality of style and temperament that cuts across generations, given exaggerated notions of individuality and progress in art, but Woods clearly embraces such antecedents. Work of this caliber make these affinities interesting and empower the as a living tradition (albeit a subversive one). Collage may have been naughty art a century ago, but nowadays, done with commitment, it’s the real deal.